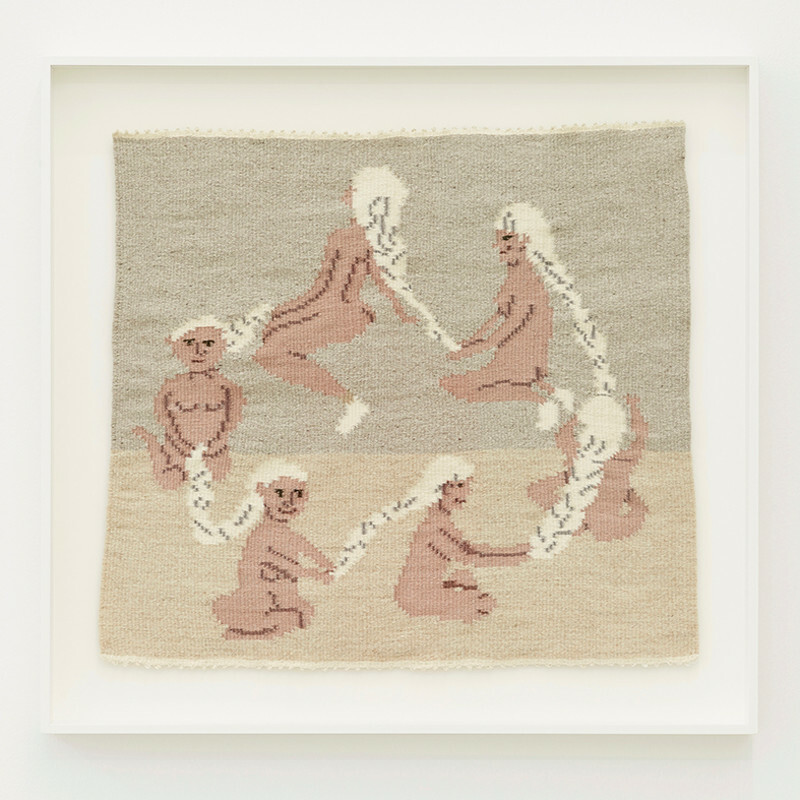 Arna Óttarsdóttir’s (b.1986) practice explores the traditional methods of the loom, creating elaborate tapestries. The visual source derives from her sketchbooks, where she does not select the final motif based on refined finish, but rather on the possibility of future exploration. The exhibition reflects an enquiring process in which Óttarsdóttir experiments with the material, pulling it this way and that, either with purpose or in quest. All the experiments she has taken on lead to completed works, even though it may entail unravelling a thread or two. Thus the audience is invited into a process of discovery and gets a taste of the joy of training in and mastering a craft. The works display the principal characteristics of tapestry; interplay on horizontal and vertical axes. In the weaving, Óttarsdóttir continually seeks to break away from tradition by opting for images of varying complexity with diagonal lines, spirals, and circles. The prototypes come from her sketchbooks and the importance from one image to the next seems to be rather equal and without hierarchy. And yet, on closer inspection, there has been a selection and execution during the process. The look of the amalgamation has been tested and some images have been tinkered with, as can be seen with large splotches due to digital editing or erasing. All this, in addition to several eccentric details from sketches and other sources, is conscientiously addressed in the weaving projects. It is tempting to look at Óttarsdóttir’s work, as textile, in light of the medium’s history over the past decades, with the appropriate references to social and feminist critique. Yet it seems like Óttarsdóttir actively tries to bypass that discourse by emphasising her own process of discovery and love of experimentation. Ultimately Óttarsdóttir is driven by the same idea – the transformation of the mundane and unremarkable into something of significance. The works project the joy and wonder of alchemy, generating value from of nothing but diligence and ingenuity.